Again, SEO is unpredictable, yesterday they allow your site to stand at the very first page of a Google search and the next day you are already on page 10 just because your site is not mobile-friendly. This is just one example of an update that needs to be followed. Keeping up to date with how online marketing works will decrease your chances of SEO failure. SEO is not a steady method. Discovering new techniques will help you get on the right road. Sometimes it’s good to go rogue and try techniques that might be acceptable in Google’s algorithm (we don’t recommend it). But consistently doing so will only lessen the quality of your page. Use Google’s Webmaster Tools to keep you on track. They provide tips and instructions on improving the quality of your SEO ranking. It is a good place to run a check on your website and find out if it has bad links, duplicate titles etc. When your site doesn’t have anything new to offer, then what’s the point of publishing it on the first page of a Google search? It’s common practice to be unique as possible. Some developers call this as “black-hat SEO” which means they use assertive methods meant for SEO alone. It was a good practice back then but with Google’s growing list of guidelines, it might mean trouble. You are not just decreasing your visiting numbers but you are also allowing other sites that are similar with yours, to take advantage of that. It must be available all the time and should load for 5 seconds max. Use online tools to calculate your site’s loading speed and use powerful coding. Practicing balance is important in SEO. That includes a balanced number of long tail keywords and ads. We have learned in the past that keywords are necessary for SEO. Right now, we have long tail keywords that are used to specify what your website offers in the market rather than creating a content with unnatural repeats of keywords. For ads, Google is against excessive ads above the fold. You may be paid for those ads but it will gradually reduce your visits and quality as well. Overstuffed incoming and outgoing links can also harm your website’s quality as they can be reviewed as link farms and search engines might penalize you for it. Encompassing your site with healthy SEO practices might offer slow improvement but it surely won’t cause you issues that will take a lot of your time. 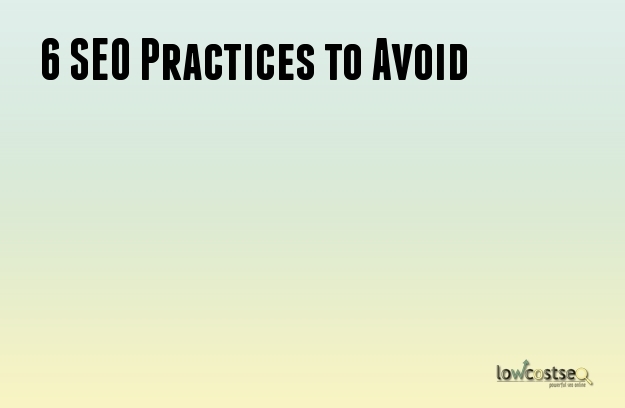 These may be just 6 of those bad practices but taking away half of it can help you use SEO properly.